Vero is an email marketing platform allowing you to send both triggered and manual email campaigns, segment and filter customers and track everything email-related in one dashboard. 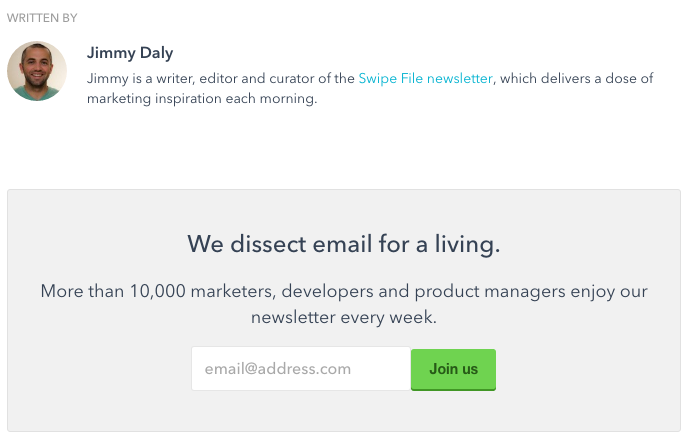 Their blog, led by Jimmy Daly (whose content I love), focuses on email marketing, with an impressive and useful emphasis on case studies. 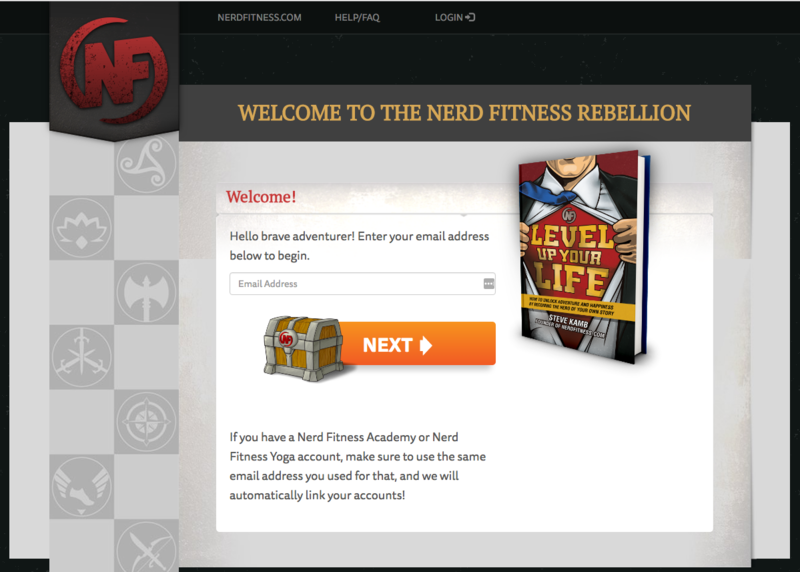 Nerdfitness.com is one of the most popular fitness blog ou there (Alexa ranking just over 8,085 – for a fitness blog!). 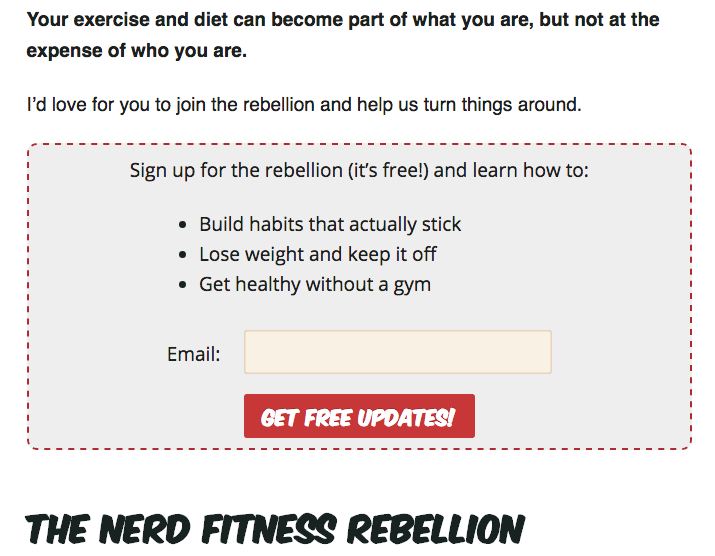 It’s run by self-proclaimed “Fitness nerd” Steve Kamb and is focused on “inspiring the hell out of you to make positive changes and live a better life.” Steve aims to educate readers on how to work out properly, cook a decent meal, and consistently improve your health and well being. 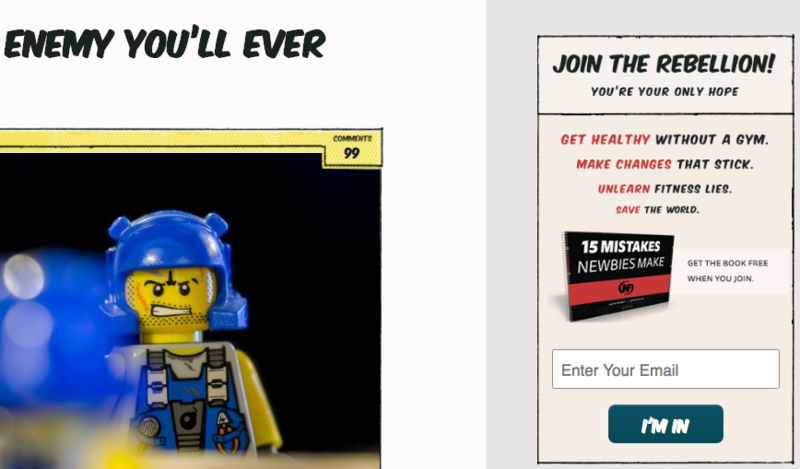 The blog’s niche target market – nerds – gives it a very specific tone and copy style (Steve focuses on “leveling up your life”), which makes it an awesome example for niche businesses looking to generate leads. 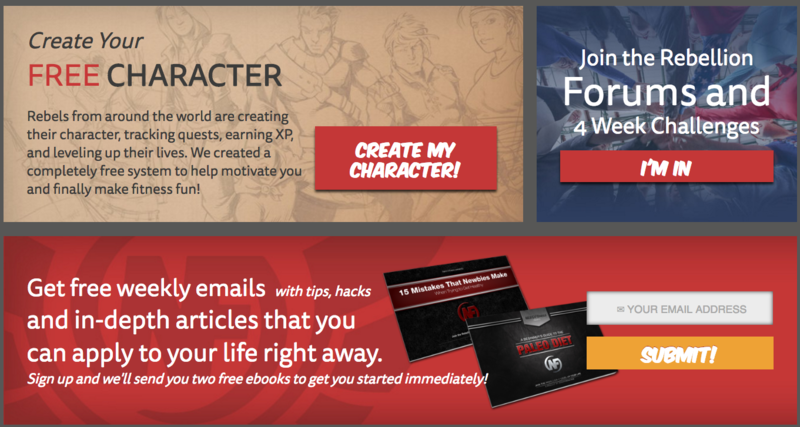 The “Create a Character” gamification is absolutely perfect for this website and its target market. 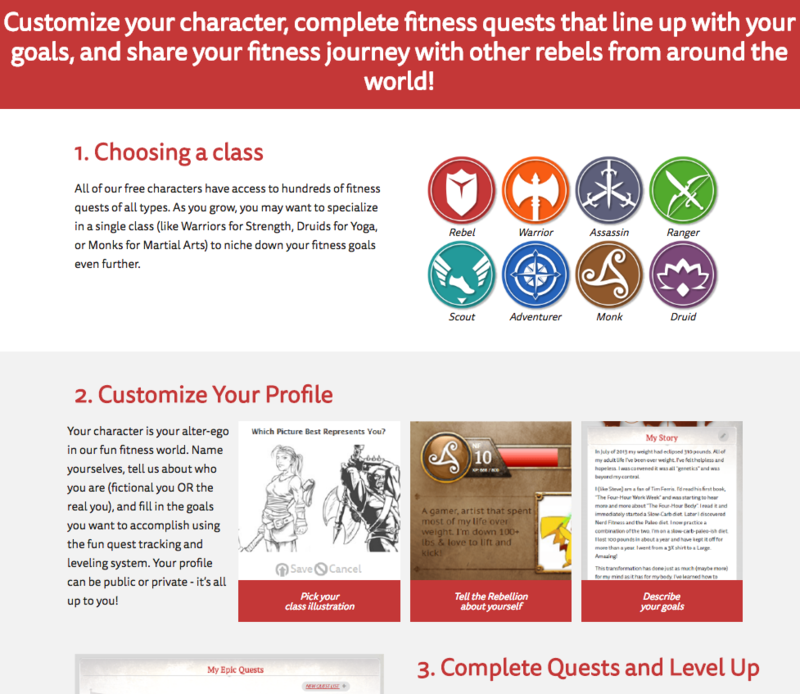 Choosing a “class,” going on quests, levelling up – all through fitness and diet – is both fun and appealing to the “nerd” in everyone. 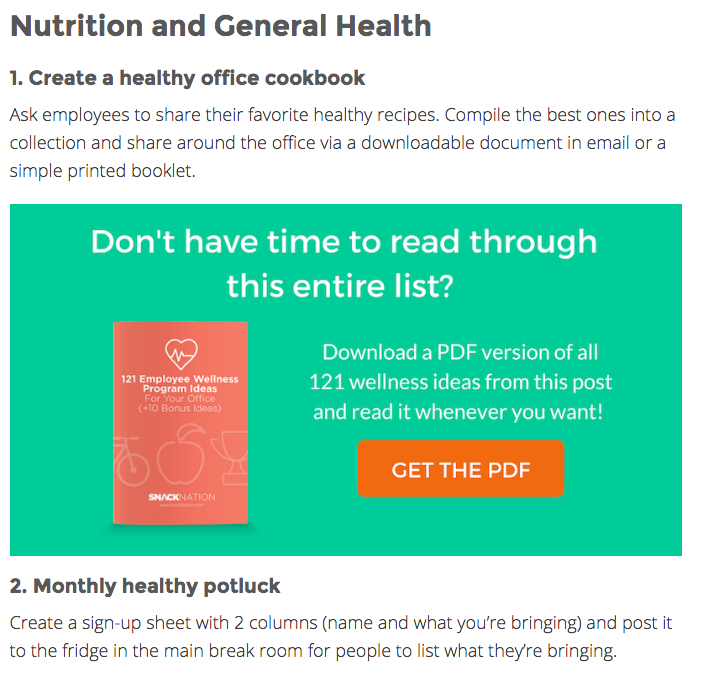 Although the character-based lead nurturing is, I’m sure, a lot more work than simply sending leads a PDF of recipes and workout routines, I have no doubt that Steve and NerdFitness have been more than paid off for their investment. 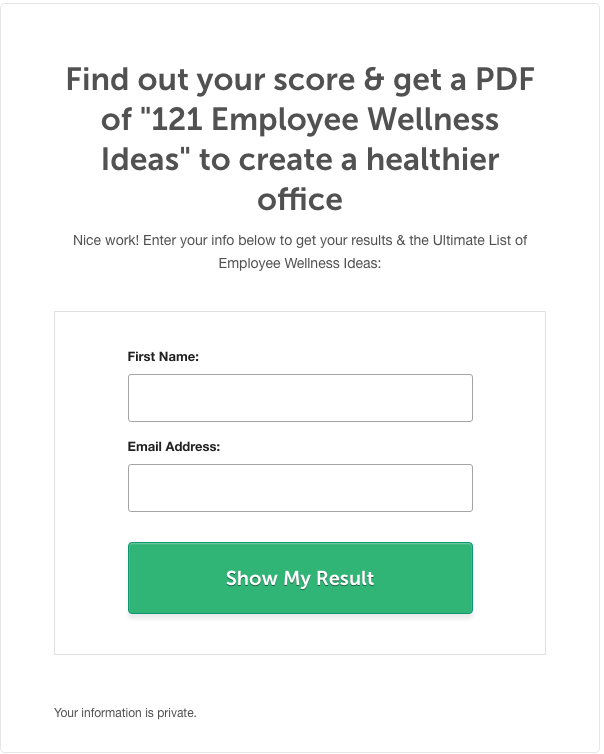 Their blog is focused on that goal, delivering engaging content about team-building, party ideas, office breakfast ideas and much more – all about wellness and a healthy, happy work environment. 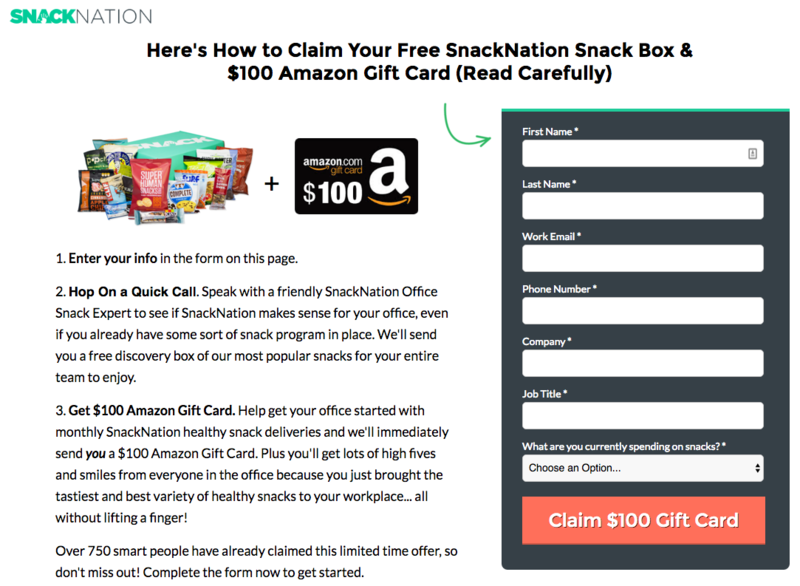 SnackNation uses the whole gamut of possible blog and website CTAs, forms, overlays and scrolling bars to generate leads. I love their drive, and there’s no one element which stands above the rest (though the quiz is pretty cool). 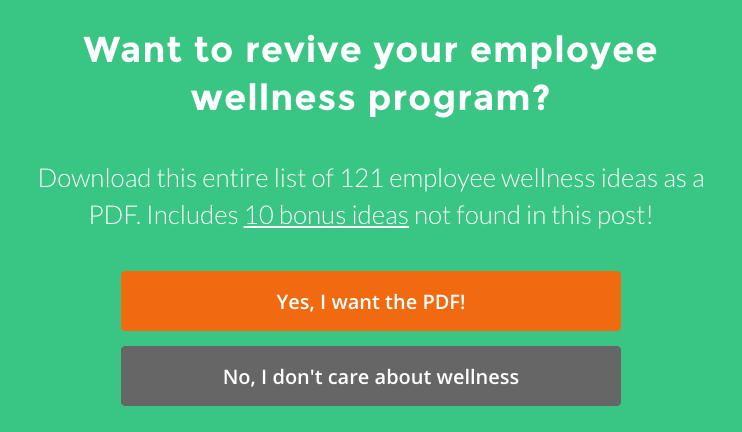 Each one is branded, and each uses best practices – from the overlay’s negative CTA “No, I don’t care about wellness” to their landing page design. Canva has exploded in the past couple years. With the influx of visual content creation, a (largely free) platform which makes it easy to create presentations, social media graphics, infographics and more is a no-brainer. Canva gives you thousands of free stock photos, add filters, import free icons and shapes and work with hundreds of fonts to quickly and easily create beautiful visual content. 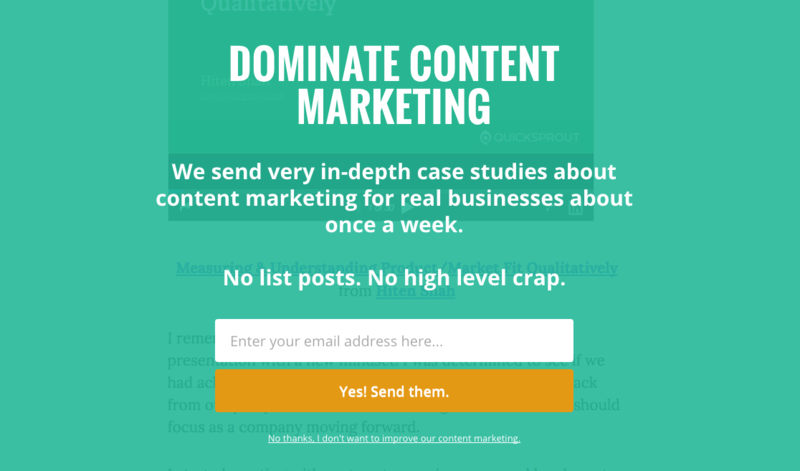 And their blog is devoted to making it easier on users and content creators to design like pros. 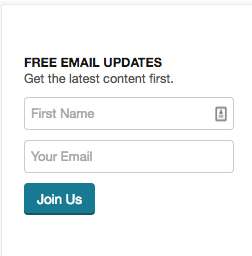 I like the “notify me” aspect of their upcoming gated content. 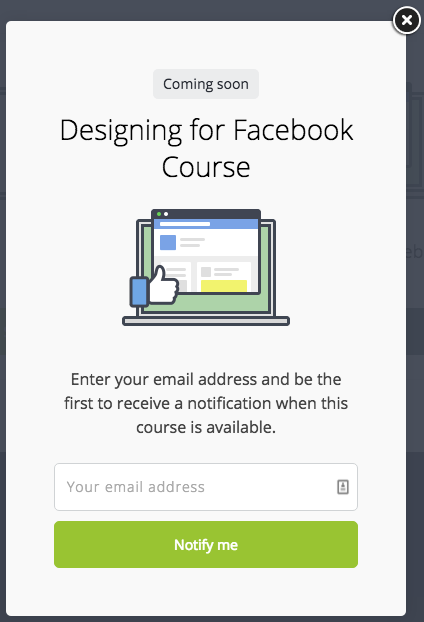 Anybody who’s downloaded one of Canva’s design resources knows how valuable they are, and featuring “what’s coming next” is a great way to get a little bit of hype before the content is even released. 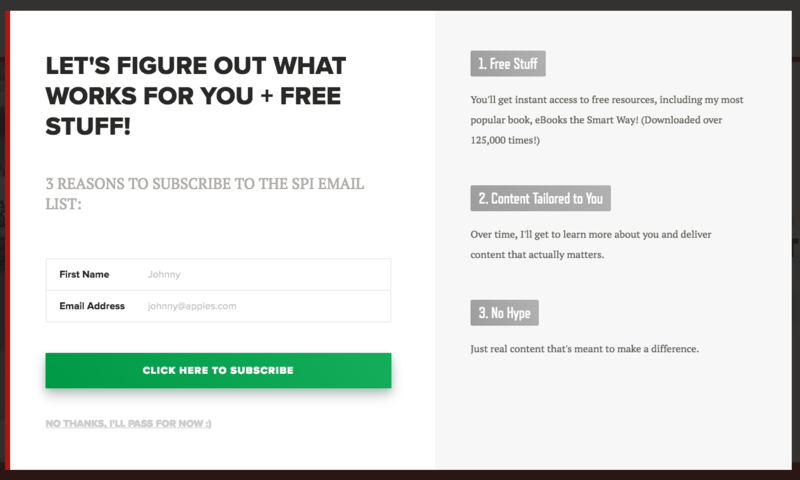 It also gives you a segment of leads you know are hyper-interested (interested enough to opt in to receive notifications of future content) – making them more qualified. CoSchedule is a leading marketing organization software company. They’ve created individual “hubs” for your inbound marketing process (from content creation to lead generation and beyond), social media planning and strategy, digital marketing campaigns and everything editorial. 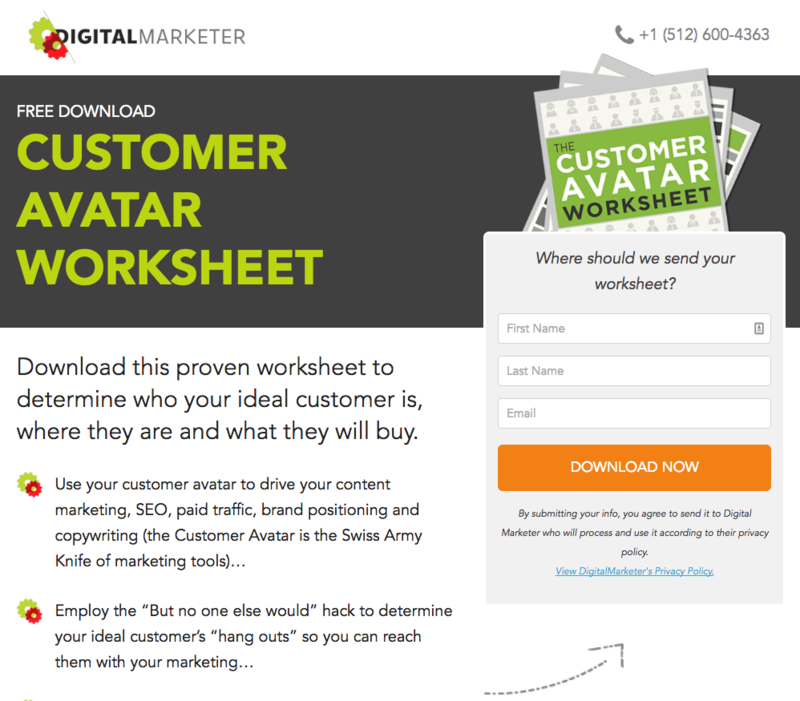 I love that CoSchedule has developed a bunch of tools which are part of their paid service and this one, which is solely created for generating leads. They also offer a few ungated tools (notably their headline analyzer). 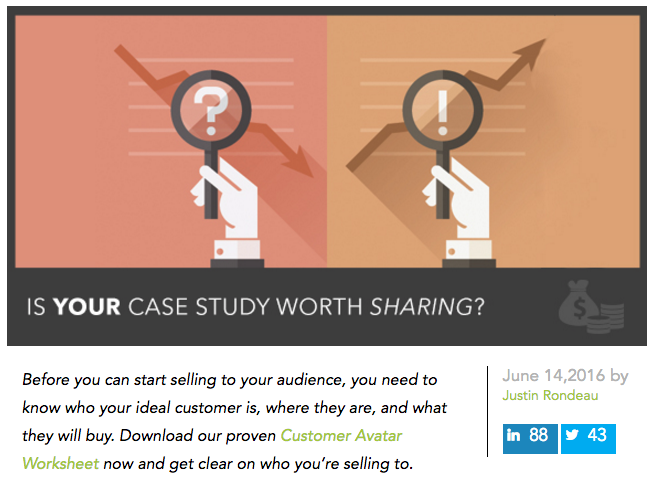 All of these free tools increase their perceived value as a brand. 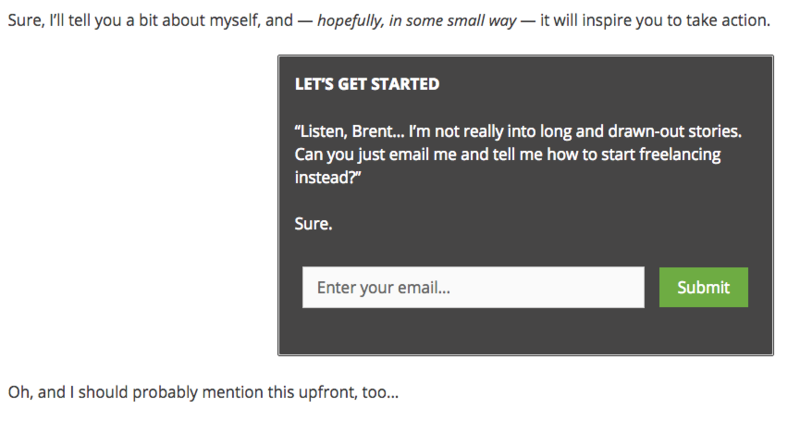 When you’re asked to provide an email address (after already getting a bunch of value) you’re far more likely to do so. 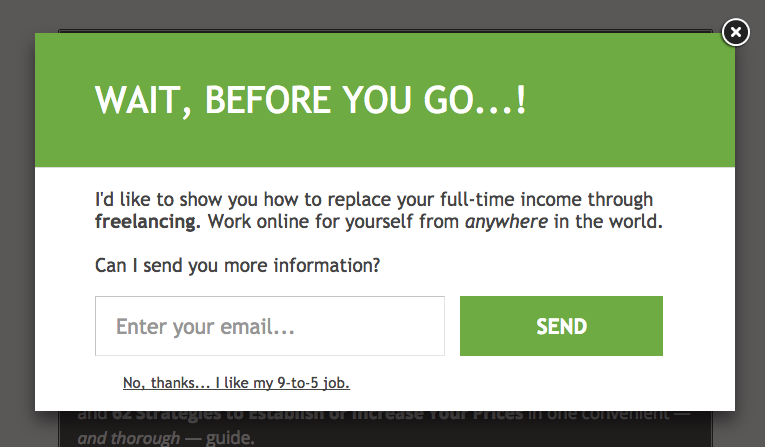 And when you’re asked if you want to start a free trial, the chance you say yes is that much higher as well. SnapApp is a marketing platform which creates tools helping your business create, publish, manage, and measure your content. SnapApp features templates, asset libraries, design tools and global account settings to speed up your ability to create awesome inbound marketing content and campaigns. 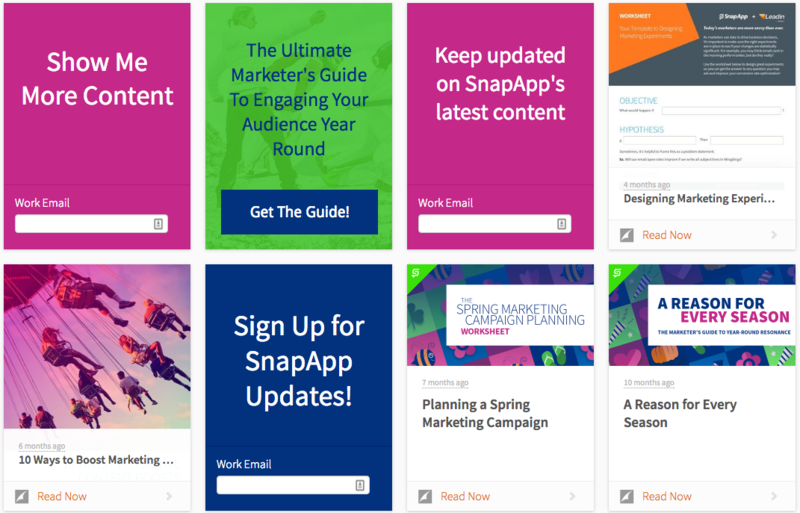 SnapApp email-gates almost all of their content, from webinars to white papers, case studies, ebooks and questionnaires. Because of this, I’m sure they’ve measured the return they get from giving away content (like CoSchedule does) vs gating it all, and decided on the strategy which works best for them. I like their commitment to an informed strategy. It defines inbound marketing as what it really is – a strategy which must be researched and measured and then committed to. 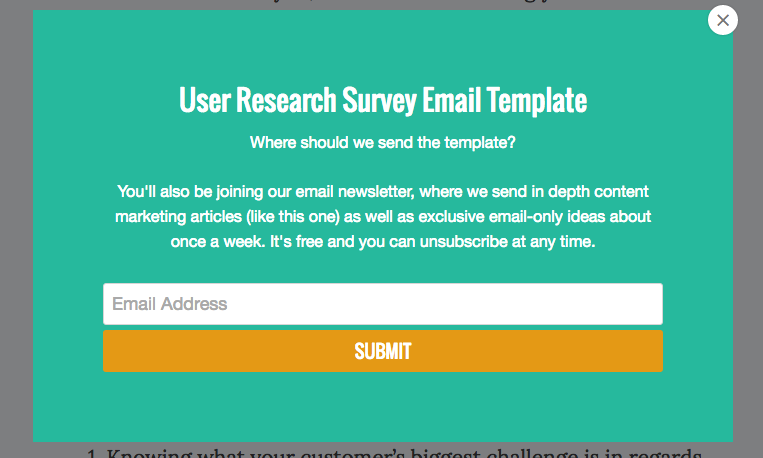 If I had to choose a top lead generation strategy, their questionnaire and the gated results is a winning one. Lead generation for most marketers has become stagnant. We know what “works” for us, and stick to the status quo. But to level up their lead generation, marketers needs to think outside the box and develop experiences that will resonate with their audience. If we think in terms of “downloads” instead of new business, we won’t move the needle. So how do you create an experience? Start by humanizing your message and delivering it in various ways to connect with more people. 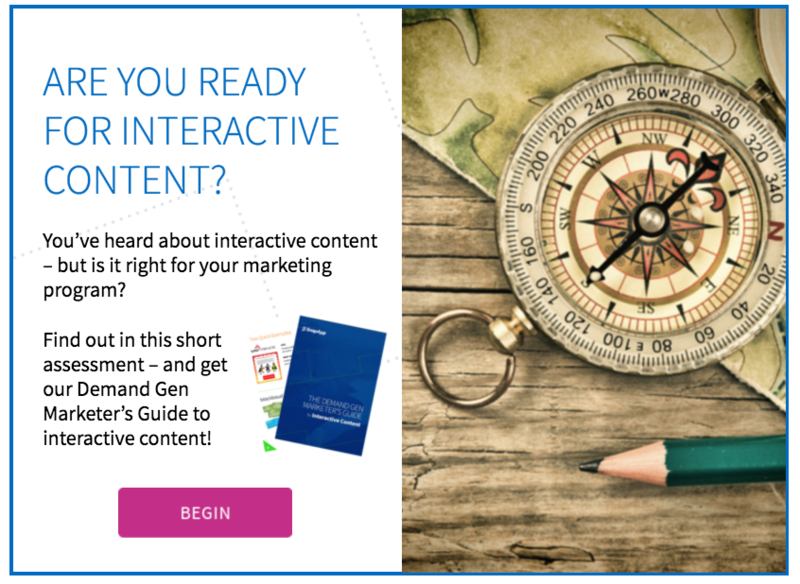 Interactive content is a great way to diversify your content and convey your message in an interesting way that resonates. 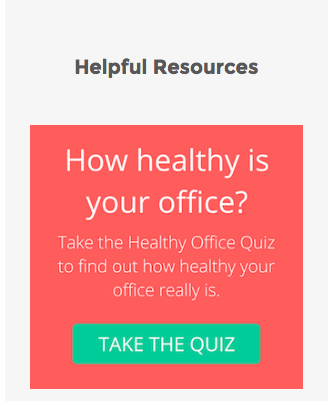 Get started by trying a survey or assessment using the content from a white paper. By creating consumable content that’s fun, you’ll create more opportunities to capture leads and start the kinds of conversations that lead to new business. 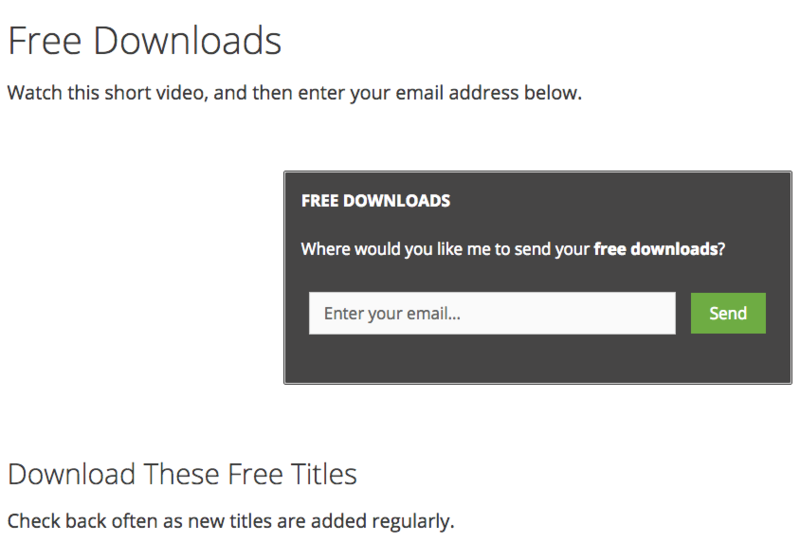 Go beyond downloads! Amy is a social media strategist and leading industry influencer. She worked with Tony Robbins for years before breaking out on her own. 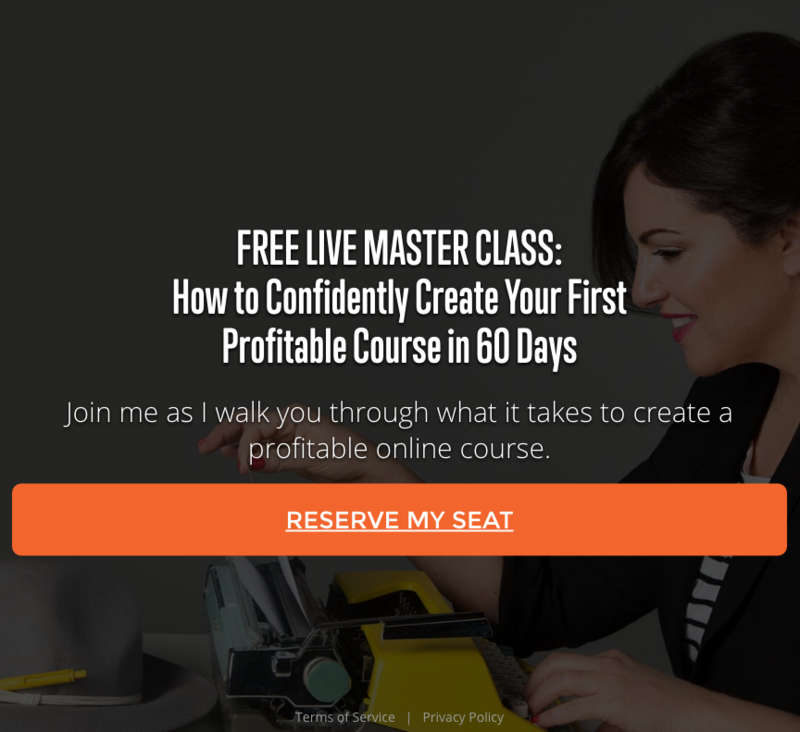 Today she helps entrepreneurs (primarily through her impressive webinars) get the most out of social media and increase their online marketing success. 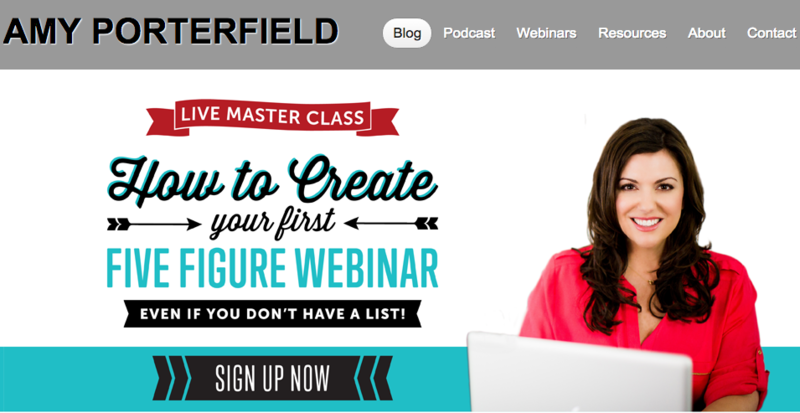 Amy Porterfield is the queen of social media webinars. 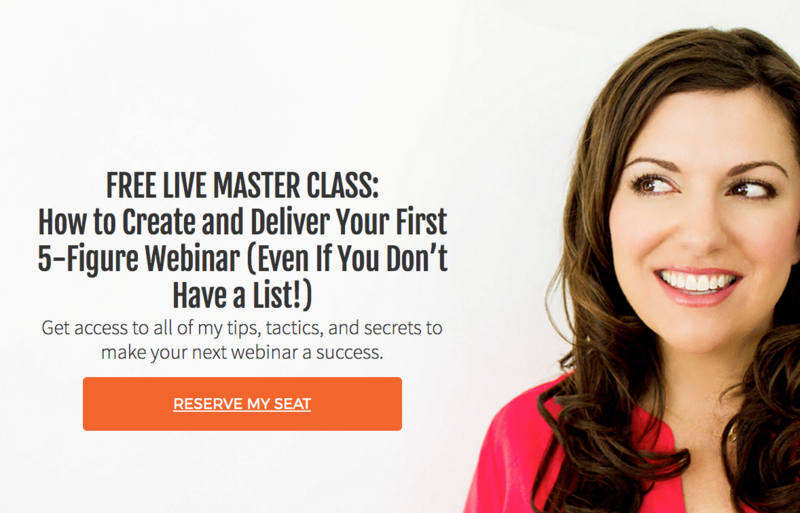 She’s been optimizing her webinar strategy for years and she’s got it down pat. I’m not going to say whether or not Amy’s webinars are pre-recorded and pushed out once a week, because that would be telling. Either way they’re super valuable and super popular. She co-hosts and solo-hosts and covers everything social media-related. Grow and Convert is a blog and consulting business founded by Devesh Khanal and Benji Hyam. Benji, formerly of ThinkApps, Everwise and Vistage (all San Francisco startups) runs the content strategy and promotion side and Devesh the list building, conversion optimization and analytics side. Their articles are long-form and extremely valuable, and their an excellent example of a highly content-centric business. 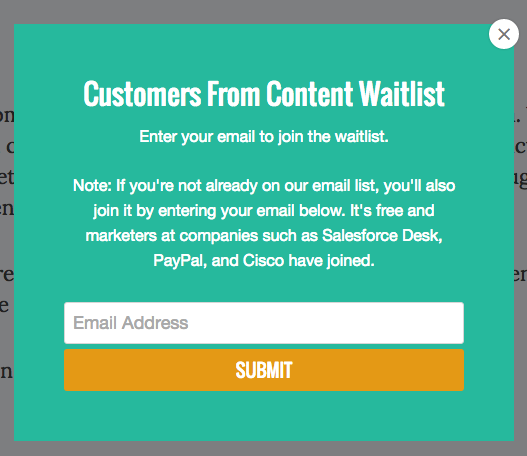 Like Canva’s “notify us when a resource is published” list, Grow and Convert uses a “waitlist” to generate leads. 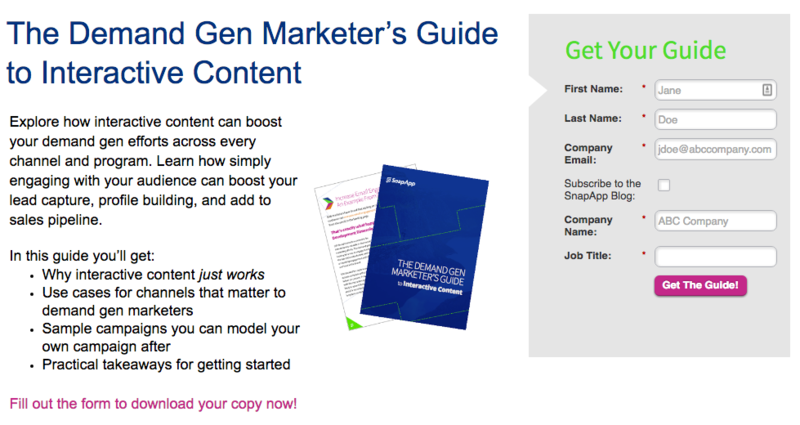 This gives them a segment of leads who are super interested in their business, and will likely respond well to any new article, gated content, or consulting possibility. 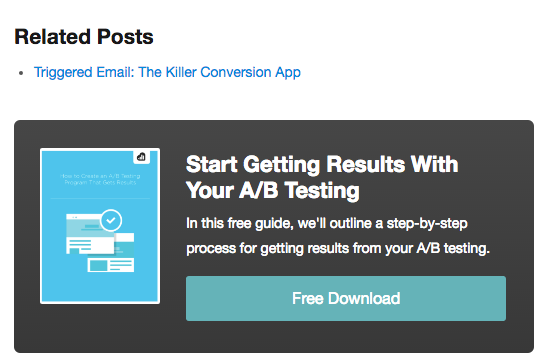 The biggest problem that I see is that most companies start testing lead gen channels without fully understanding their customer. Then when they’re not getting the results they’re looking for, they think the channel doesn’t work. This causes people to stop testing channels that could still be fruitful for the organization. It’s typically the approach to the channel that doesn’t work, not the channel itself. In order to do lead gen effectively, companies should run through user research with their customers and prospects to understand the pains and challenges they have, who their users are (psychographics and demographics in-depth), where they hang out online, etc. Then based on the findings determine the proper messaging to attract their customers, the right channels to approach and the proper targeting. If it doesn’t work the first time, get feedback, tweak the messaging or audience slightly and test again. Don’t give up on a channel after one test. 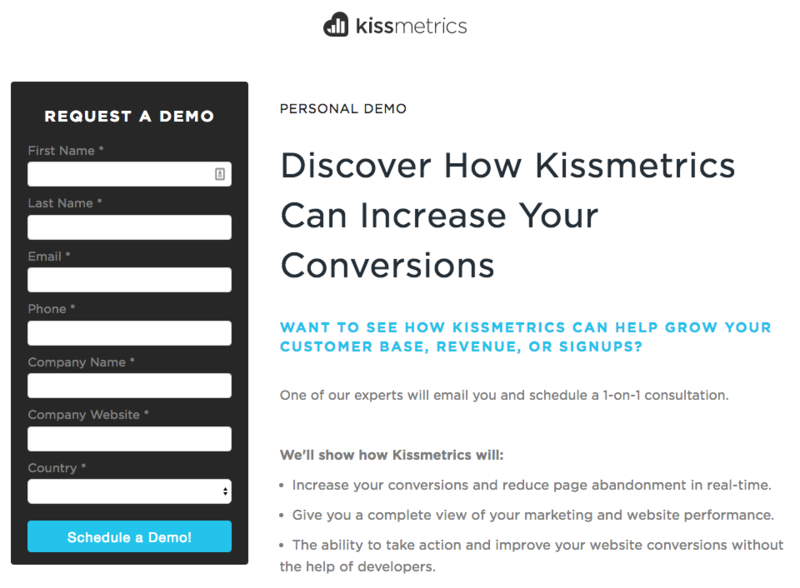 Kissmetrics is a data analysis and customer intelligence software company. 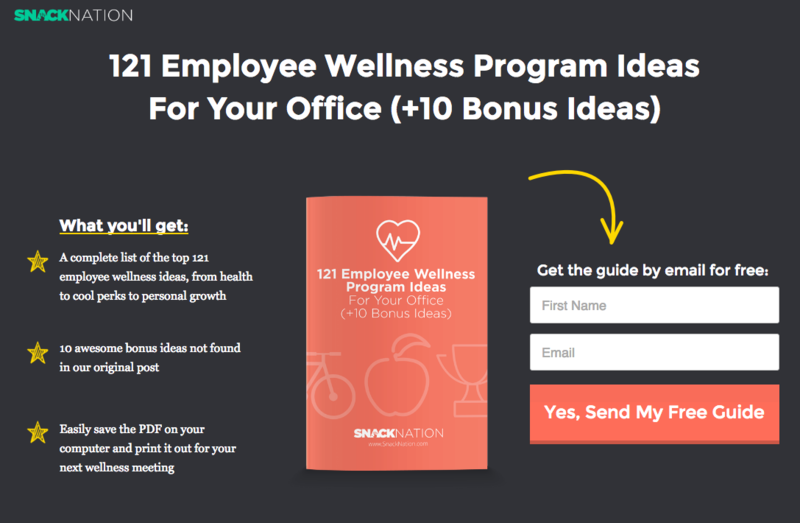 Their platform gives users insight into how they can optimize their conversion and acquisition funnels, understand and increase retention, as well as better match with customer behavior to drive company growth. The Kissmetrics blog is a hotbed for excellent guest contributors as well as their in-house content creators. It focuses on conversion optimization, analytics and email marketing (pretty much everything their target market might be interested in). 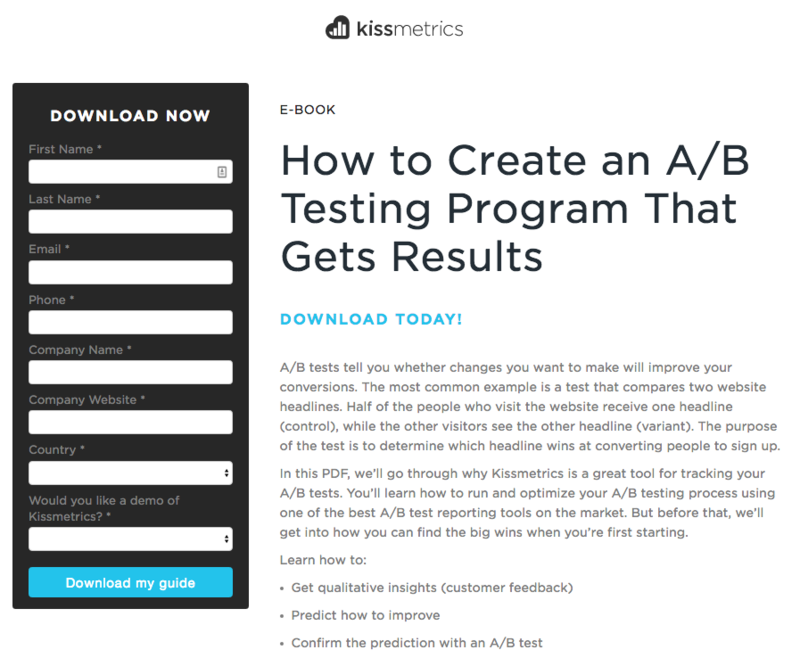 Kissmetrics has an excellent gated content landing page template and they use it for everything from their VIP demo to their ebooks and webinars. 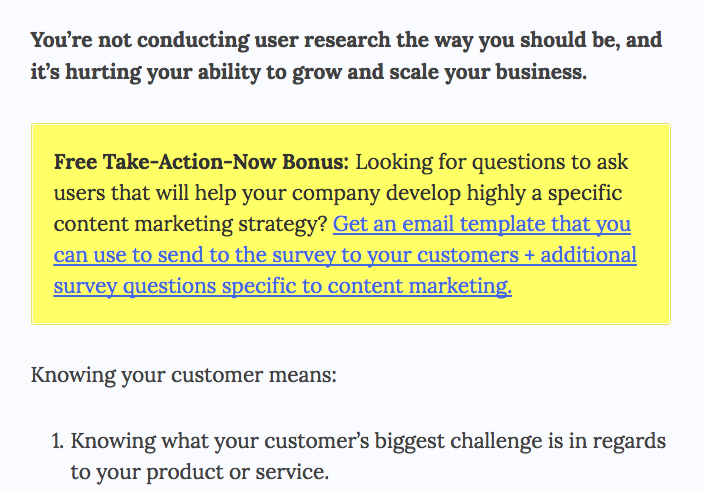 They ask for a lot of lead info which isn’t against best practice, so long as their offer is worth the “ask.” It’s branded, optimized and, if they test it they implement the winning variation across the board. That, my friends, is definitely best practice. SmartPassiveIncome is the brainchild of Pat Flynn. It’s built around his (quite substantial) empire teaching entrepreneurs how to generate passive income – income generated while you sleep. If you think of Pat’s “1-Day Business Breakthrough” sessions as a final, paid conversion (he has others, but just go with it) then the “business breakthrough” subscription is an awesome way for him to get people in a nurturing funnel. 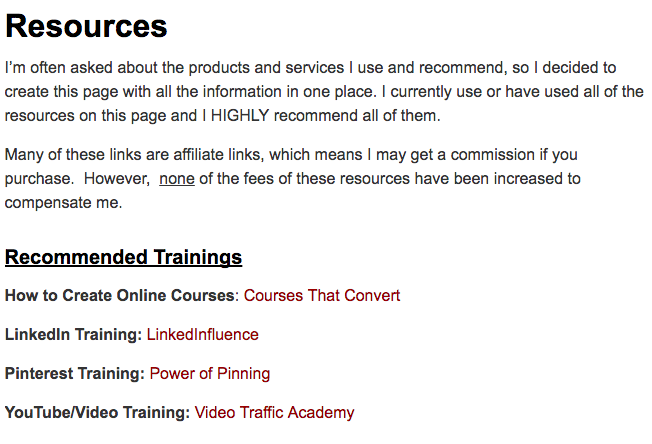 He gives some of the session podcasts away for free, delivers a couple videos right off the bat and then, slowly but surely, shows you how valuable his complete session (only $197) are. It’s the definition of segmented lead generation followed by lead nurturing to a sale. 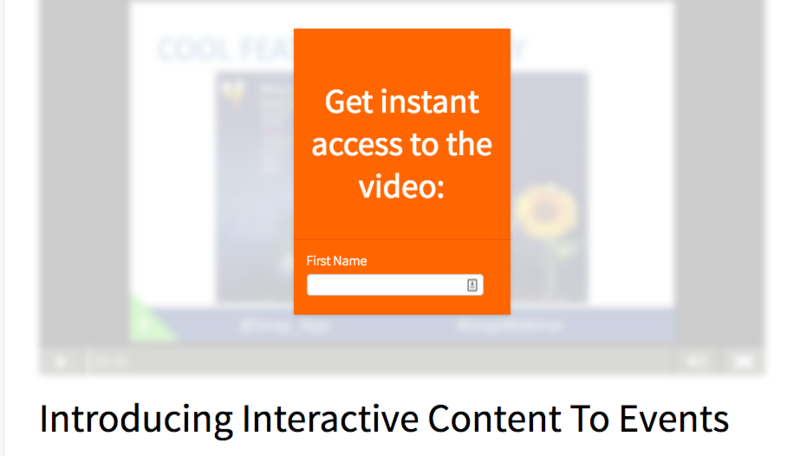 You can’t quite tell from the screenshot above, but the inline gated content form actually opens up a gated content vault (as Eric Siu would call it) – giving you access to a half dozen downloadable resources. 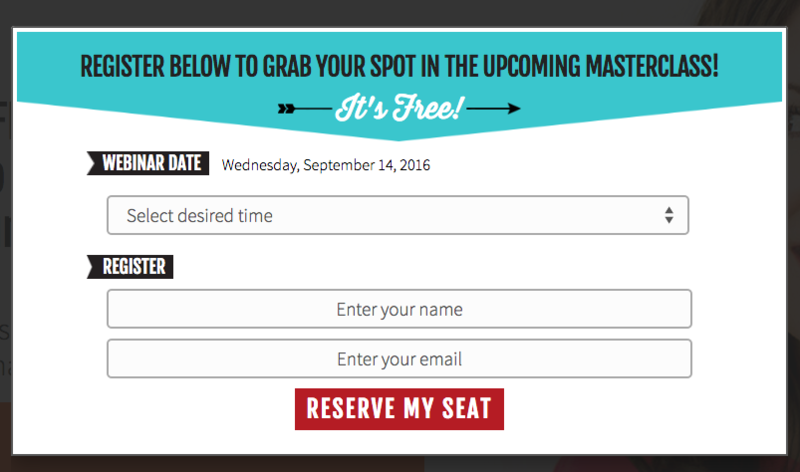 This is a really cool way to generate leads, as it feels so much more valuable than a single resource. And, when you think about it, once you have your lead’s information from one ebook you shouldn’t be gating the others anyway. 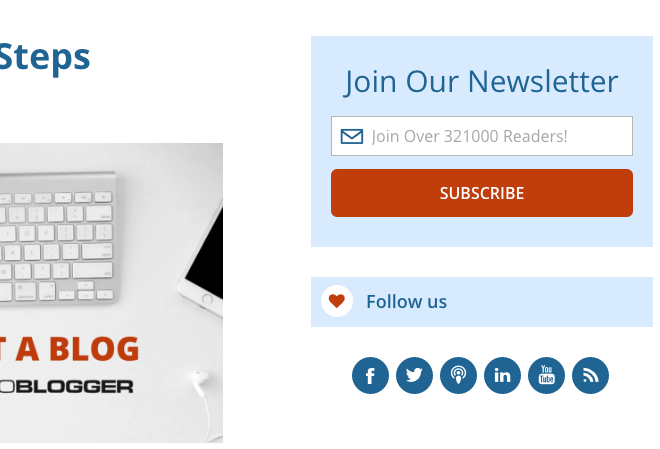 In terms of attracting new email subscribers, one strategy I have found highly effective is creating multiple relevant lead magnets. 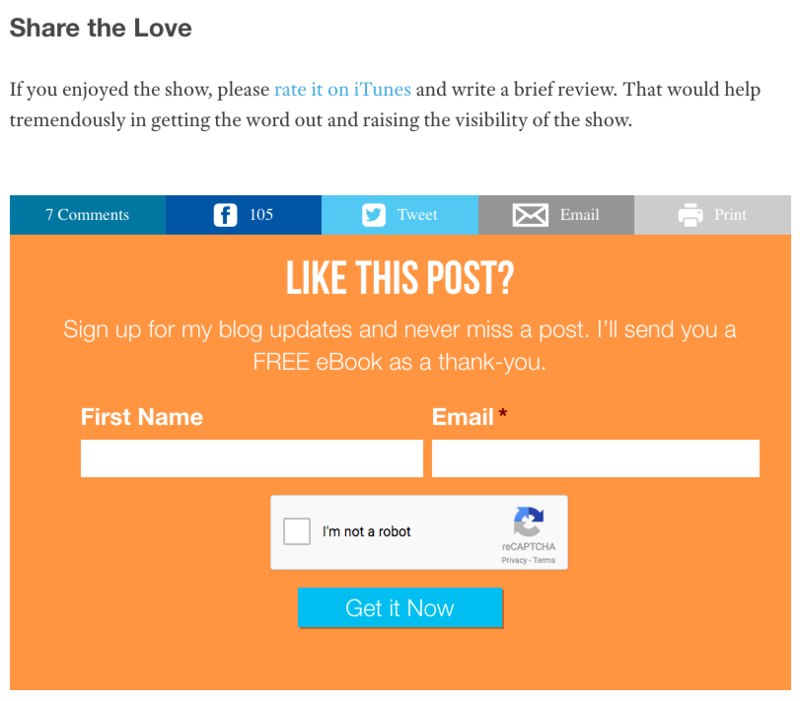 I then embed opt-in forms within the body of my blog content promoting the lead magnet that most closely relates to the topic of the post. Say, for example, I am publishing a post on time management. 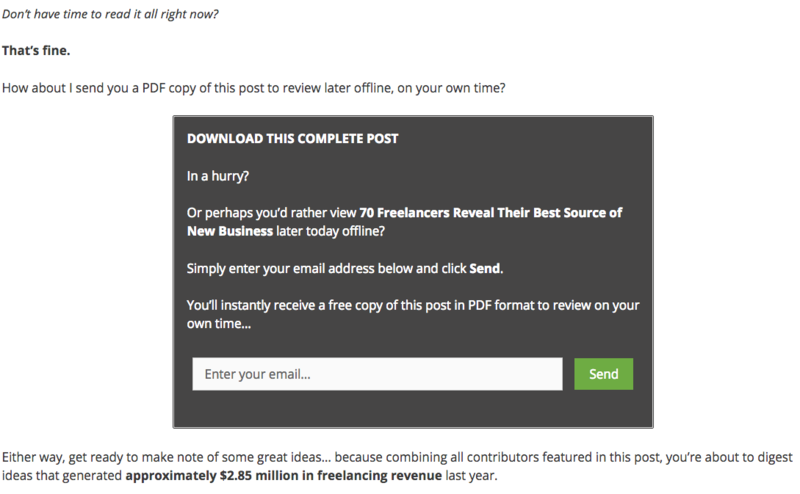 I would embed an opt-in form within that blog post promoting the free download of my recommended schedule for freelancers. Ryan Deiss founded DigitalMarketer.com as a community where marketers, growth hackers, entrepreneurs and small business owners come to get ideas on driving traffic, increasing conversion rates and boosting social engagement (so the whole gamut, really). Ryan and contributors focus on releasing proven, non-hypothetical, walkthroughs for specific growth strategies which they’ve done and invested in themselves. 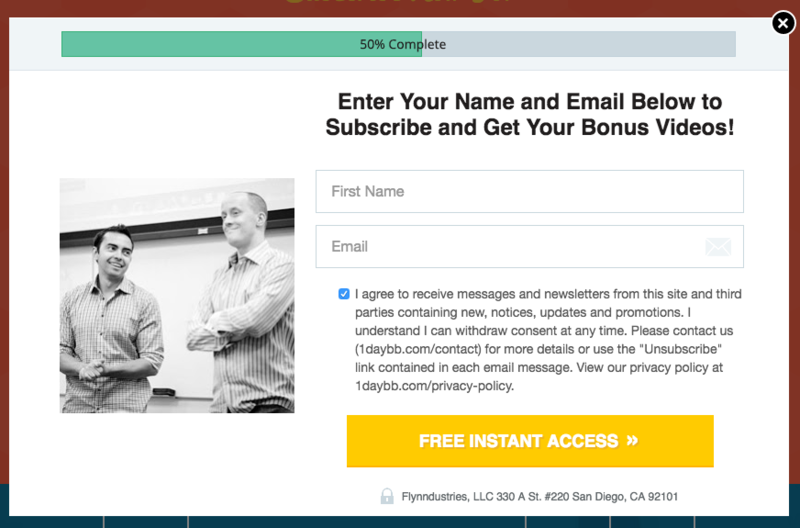 Most of Ryan Deiss’ organization is focused around paid training courses, but even they can’t help but take advantage of the email-gated, article-specific content upgrade. And you can’t blame them. They’ve been shown to convert twice as well as subject-related ebooks. 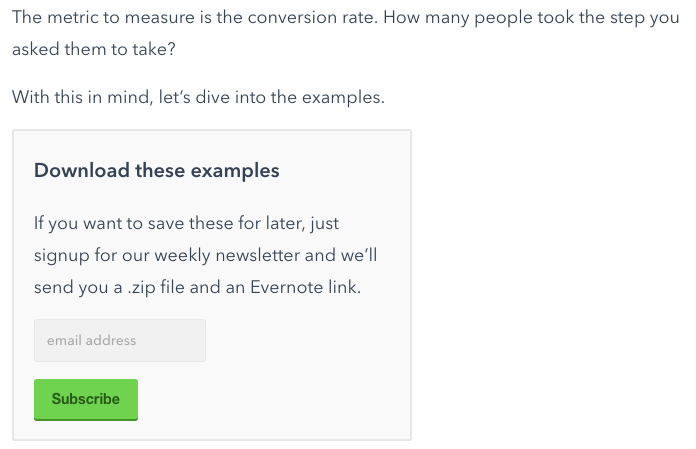 That said, I wonder if DigitalMarketer wouldn’t find even better conversion rates if they added the click popup (as most of their competitors have) instead of sending visitors to a new tab and landing page. 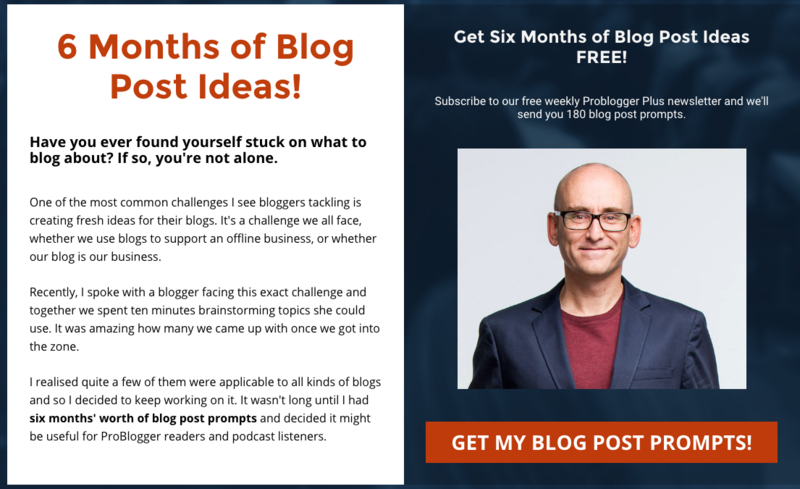 ProBlogger is the brainchild of Darren Rowse and is all about helping bloggers and content creators learn how to blog from someone who’s been doing it successfully since 2004. Darren started ProBlogger in order to “keep a record of what I was learning about blogging for money and because I wanted to connect with other bloggers making money from their blogs.” In the past 12 years, Darren has added over 8,000 articles, tutorials and case studies as well as (in the past few years) a very successful podcast. 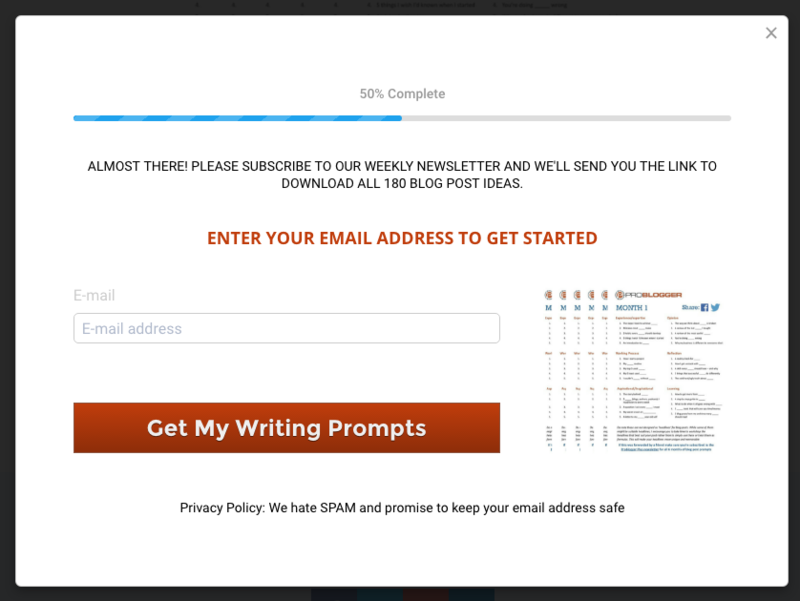 ProBlogger doesn’t beat around the bush with their blog subscription. 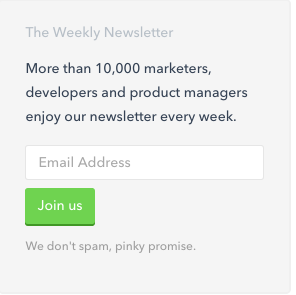 Rather, it makes it super easy to subscribe with a bottom-of-blog CTA and form, a sidebar CTA and even a homepage prompt. Michael Hyatt is CEO of (unsurprisingly) Michael Hyatt & Company, an online leadership development company. Michael writes online content, podcasts and writes hardcopy books related to finding success both in terms of your career and your life. I’m intrigued by by email-gated article here. I guess, if you have no SEO-based goals with your content, then gating it might make sense – particularly if your readers have already been convinced of the value of your content. 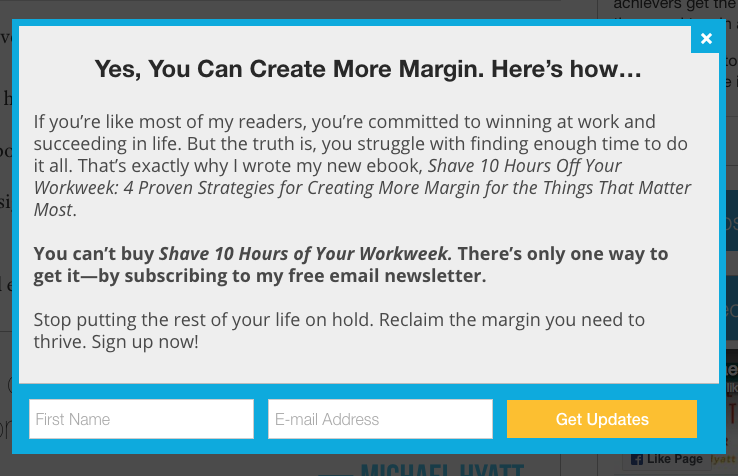 In the case of Michael Hyatt, he’s an incredibly well-known thought-leader in his industry. Anyone who knows him assumes anything he’s written is worth the same price as any webinar or ebook. Founded by Michael Stelzner in 2009, Social Media Examiner is the #1 source for social media-related content. With more than 2 million monthly pageviews and more than 500,000 subscribers, it’s one of the most-read marketing sites out there. In the past few years, SME has focused entirely on their annual industry report. They hype it up a couple months in advance and then use it as their only lead generation content for the rest of the year. It’s what the promote on all of their exit (and entry! 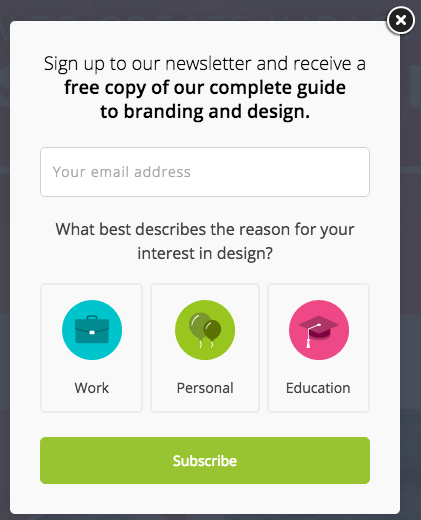 – which is new and probably being tested) popups, sidebar and at the top of their homepage. And anyone who’s ever downloaded it knows why. 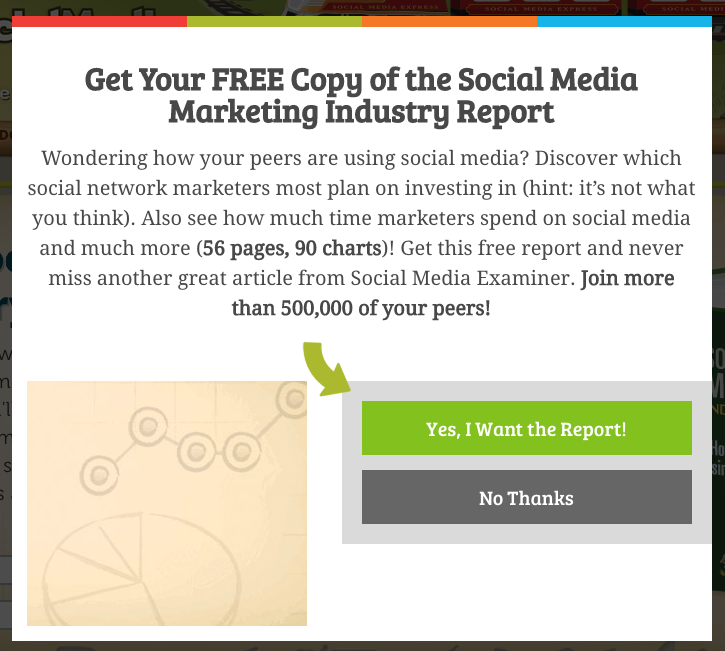 It is the definitive report for social media. It compares annual growth of every platform and asks thousands of marketers for their feelings and what they’re planning for the year. 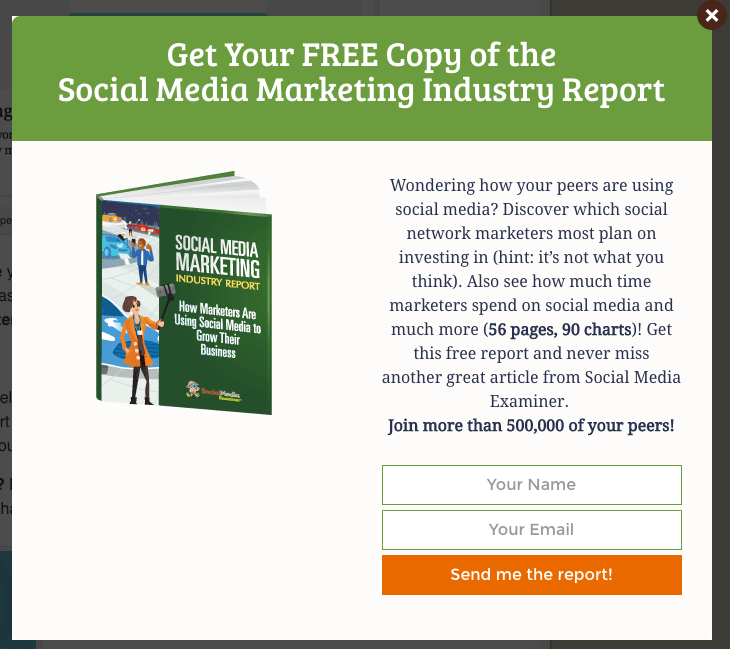 When you have an industry report like SME does, you don’t need any other gated content. 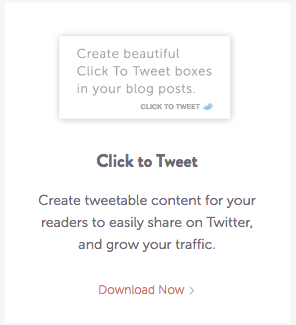 There is no silver bullet, but good content gets clicks. When developing your campaign start with a strong headline and end with a compelling call to action. 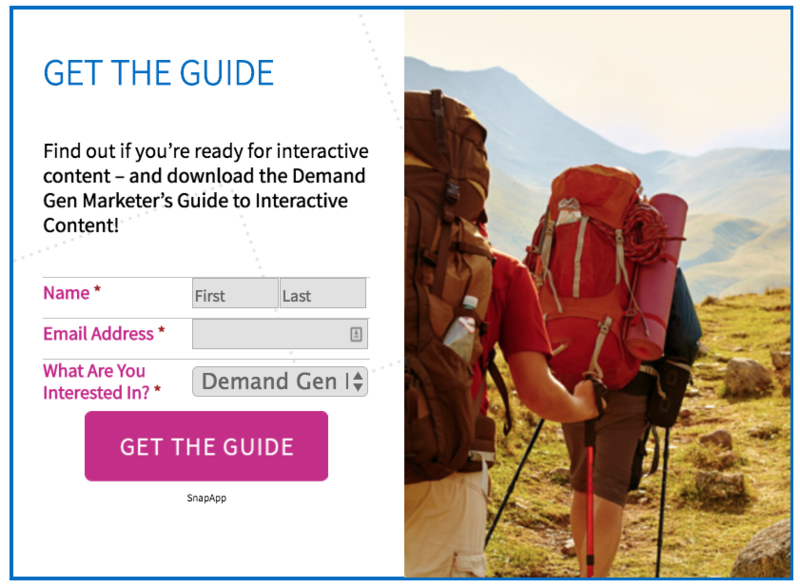 Specify what a respondent will learn and discover via that click. 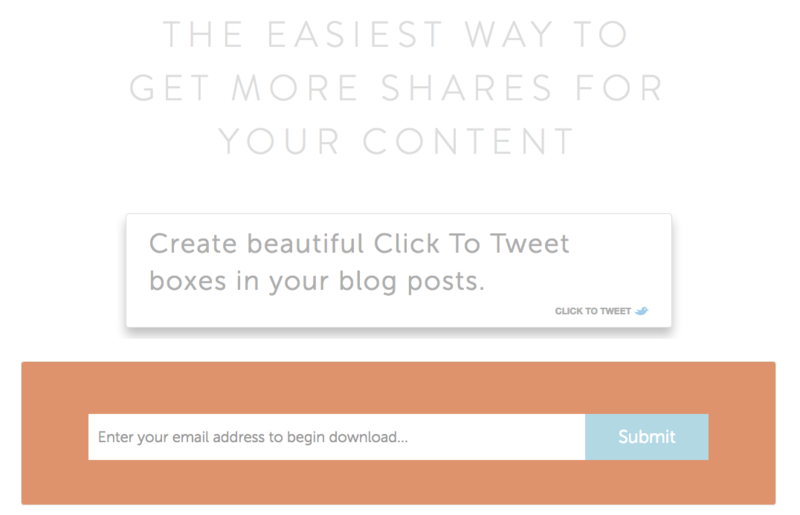 Make sure to offer something of value for opting in to your content, offer or demo.